David Parkhouse netted two late strikes as Derry City clinched a derby win at Finn Park. DAVID Parkhouse netted a late brace to clinch the spoils in a feisty North West Derby clash against the 10 men of Finn Harps at Finn Park. It was City's second league win in succession which saw Declan Devine's troops move level on points with third placed Bohemians. The win was overshadowed, however, by the nasty injury sustained by City defender, Ciaran Coll in the first half following a horrific late tackle from Colm Deasy who saw red. 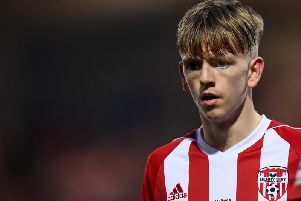 Substitute, Adrian Delap gave Derry the lead on 53 minutes with a clinical finish from 15 yards - the 20 year-old's second senior goal. Ex-Derry striker, Nathan Boyle clawed Harps back into the game on 74 minutes with a close range finish. However, Parkhouse headed Derry back into the lead on 83 minutes before adding a second three minutes into stoppage time. Mikey Place pulled one back from the penalty spot after Gilchrist was adjudged to have committed a foul on Keith Cowan but it was too little to late for Harps as they emerged second best in this lively derby clash. Devine made three changes from Monday night's EA Sports Cup win over Longford for the first of seven league matches in the month of April. The City boss opted to take no risks with experienced keeper, Peter Cherrie as Nathan Gartside retained his place in goals. Conor McDermott returned to the starting XI for the first time since the 2-0 loss against Dundalk last month while Jamie McDonagh was handed his first league start of the season. Gerardo Bruna and Josh Kerr both dropped to the bench while Gianni Seraf missed out through injury as skipper, Barry McNamee returned to bolster the City attack. It was Harps who started with purpose as they pressed well in the opening stages with a succession of free-kicks which ultimately came to nothing. Derry ventured into the opposition half with their first meaningful attack on nine minutes when McDonagh's cross very nearly fell for Junior Ogedi-Uzokwe. Coll then found McDonagh wide on the right with a terrific cross field ball to feet. The City winger took a touch before delivering an inviting cross into the six yard box but Ciaran Gallager gathered at the near post. Harps winger, Caolan McAleer did well to dink past McDermott before cutting back onto his left foot but when he got in behind the City right back for a second time, he blasted his shot high and wide. Derry came so close to taking the lead when David Parkhouse crossed from the left to find Ogedi-Uzokwe and the Englishman's towering header went narrowly past the post on 15 minutes. Harps had the ball in the back of the net on 22 minutes when Gartside's attempted kick-out hit the back of the retreating Todd and Boyle reacted quickest to slot the ball into the empty net. However, referee, Neil Doyle ruled the effort out and booked Todd much to the frustration of Harps boss, Ollie Horgan and he had good reason too. After great work by McDermott on the right, McDonagh picked out the run of McNamee who arrived late into the box but the Ramelton man took a touch and Harps managed to clear. McNamee crossed dangerously towards the near post on the half hour mark but Harkin directed his first time effort agonisingly over the bar. From a long throw-in on the left Greg Sloggett got his head on the ball but directed it over the bar as Derry began to take control of proceedings. City almost capitalised on a quick counter as McNamee found the run of McDonagh with a delightful pass in behind the Harps defence but the Lisburn man's powerful drive was tipped behind by Gallagher. Harps were reduced to 10 men on 37 minutes as Coll after Deasy's horrific late tackle on Coll. It marked the end of the night too for former Harps skipper, Coll who had to be stretchered off with a suspected broken leg. Cowan twice came close with headers for Harps in the closing minutes of the half as both teams went in scoreless. Derry finally broke Harps' resistance on 53 minutes. Ogedi-Uzokwe picked up possession on the left side of the Harps box before delivering a neat disguised pass towards Sloggett who swivelled on the ball. Delap took control as he pounced on the loose ball and struck a blistering effort in off the underside of the bar. It was a superb move which began with a quick free-kick on the right from Harkin which had set Delap scampering clear. And the Donegal lad finished for his second senior goal. Gartside needed to be alert to parry away McAleer's close range strike after the winger was played into space by a brilliant reverse pass from Tony McNamee. Harps were once again denied by Gartside on 64 minutes when McNamee's long throw-in was met by the head of Daniel O'Reilly at the far post but the City stopper saved well with his feet before Derry eventually cleared the danger. The Ballybofey men were back in the game on 74 minutes as Kavanagh's cross was helped on by Todd and Boyle took a touch before slotting past Gartside. O'Reilly came close to adding a second two minutes later when he got onto the end of a clever McAleer free but he fired over the bar from a tight angle. Derry hit the front with seven minutes to go as Parkhouse got onto a wonderful cross from McDonagh and his powerful header nestled into the top corner. Ogedi-Uzokwe was sent scampering clear in stoppage time but was denied by a neat save from Gallagher. Parkhouse then rounded off a superb win for the Candy Stripes when he rounded Gallagher and slotted into the net from close range deep into stoppage time. Referee, Mr Doyle pointed to the spot in the fifth minute of injury time after seeing a foul, committed by Gilchrist and ex-City winger, Mikey Place slotted home. It wasn't enough however, as City celebrated the first derby win of the season and no one celebrated more passionately than Devine who ran across the pitch punching the air to congratulate his players,. Finn Harps: C. Gallagher; C. Deasy, N. Logue, S. Todd, D. O'Reilly; C. McAleer, K. Cowan, J. Borg, T. McNamee, J. Kavanagh, N. Boyle; Subs Not Used - P. Burke, M. Timlin, M. Russell, M. Place, M. Gallagher, L. Walsh, S. Doherty. Derry City: N. Gartside; C. McDermott (D. Cole 58), E. Toal, A. Gilchrist, C. Coll (A. Delap 41); J. McDonagh, C. Harkin, G. Sloggett, J. Ogedi-Uzokwe; B. McNamee; D. Parkhouse; Subs Not Used - D. Houghton, G. Bruna, E. Tweed, E. Stokes, J. Kerr.